Necessity and her daughter, Invention. Don't you hate blogs that start with a tired, old cliche? I know I do. I am from Lancaster, Pennsylvania. Lancaster has a lot of barns. Barns have doors that slide along a track. Lancaster also has a lot of retirement communities. I think you know where I am going here.... No? Let me back up. 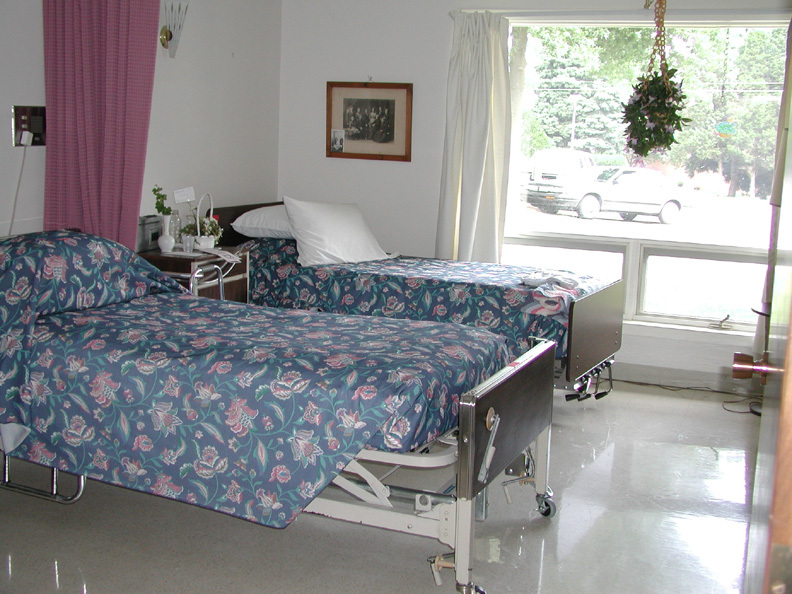 One of the biggest trends in the last 20 years is trying to get some privacy into shared, or double-occupancy nursing rooms. This makes a lot of sense. Shared rooms are much more economical, as that means building half as many bathrooms as private rooms. But residents, family members, health care staff and even HIPPA, want some privacy for each individual occupant. As square footage is king, any ways to improve privacy in tight spaces are at a premium. 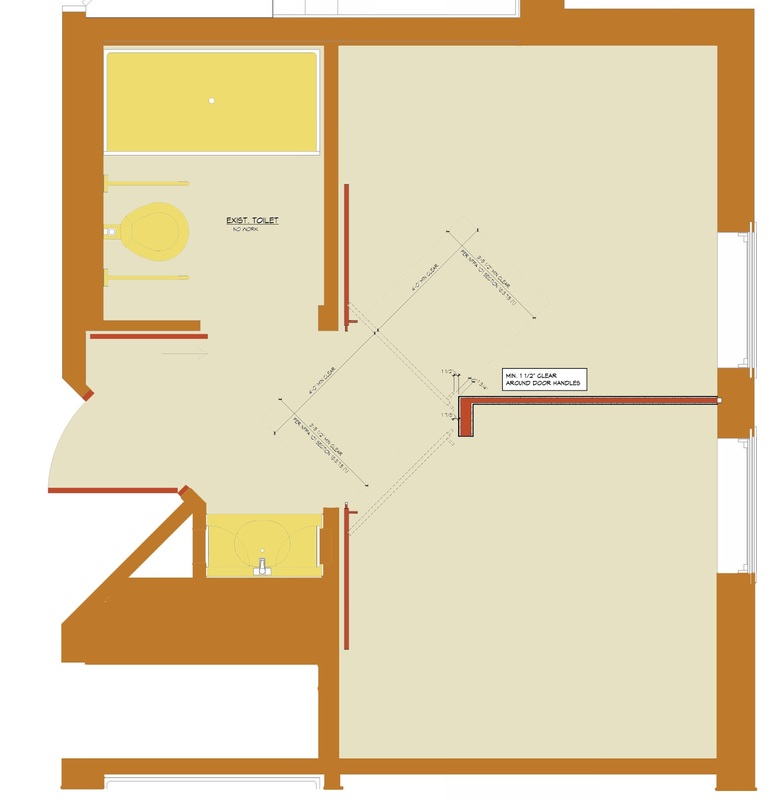 Ideally, we would layout a new building to provide layouts that accommodate separate quarters for each resident, along with a common foyer that allowed for entry into the bathroom as well as the corridor. Pretty straight forward, but this was not what most nursing rooms looked like in the early 1990's. This was a big leap. What's more, if you've ever worked in healthcare, you know that they hate pocket doors. You can't clean the pockets, yet stuff can get back there, so there is a fear of infection, etc. In our original plans, we used cubical curtains. State of the Art Circa 1990-something. "Shared Room" takes the place of "Semi-Private. What can we do to improve upon this? Doors are the obvious answer, but how? It turns out, we were able to convince the Health Department that "barn doors" are a hygienic alternative to pockets. 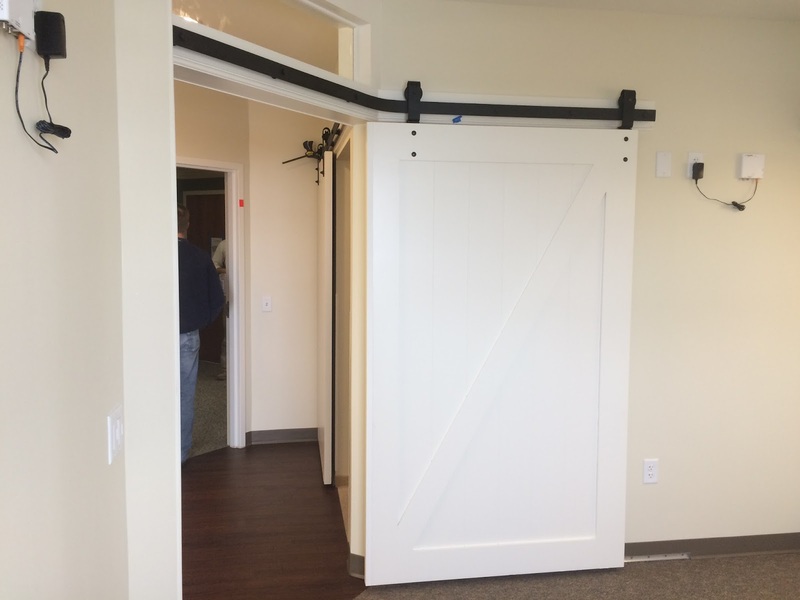 With a barn door, we get all the benefits of a pocket door and eliminate all the space a typical swinging door needs. Did I mention that all these doors needed to be 3'-8" wide to be able to move the beds through them in an emergency? Each room not only has its own space, but each bed has a window. 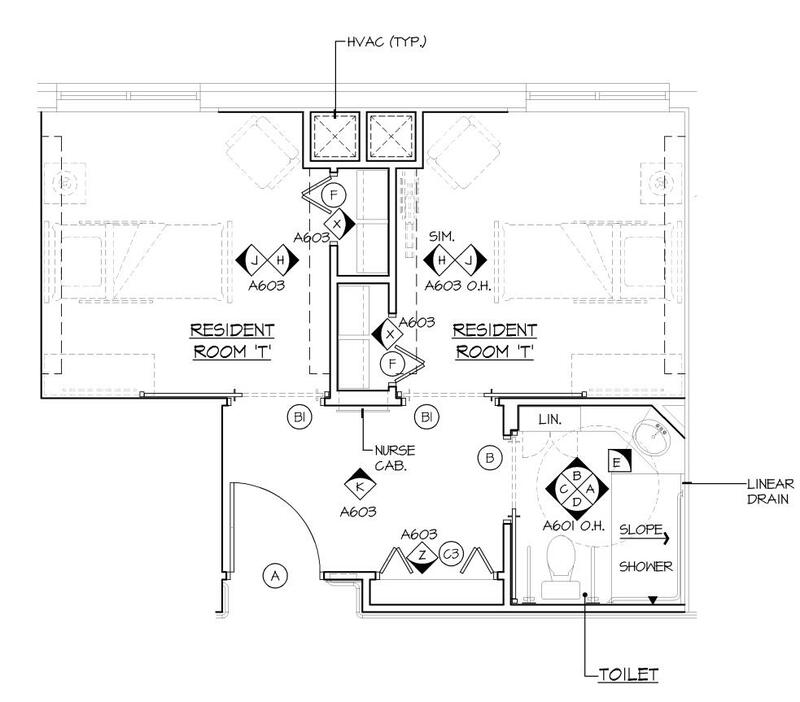 Not the case in the first example: one resident gets proximity to a window, the other gets the bathroom door! Here we had two former traditional layouts combined but maintain privacy. In the diagram above, barn doors can literally slide behind the dressers. Swinging doors would not have worked at all. The bathroom also uses a barn door. In this instance, we were completely re-configuring the space "inside the box", but were able to provide similar privacy in the renovated space as in the brand new building. But what if you have a double occupancy room which cannot be reconfigured substantially? The diagram below is an example of that. The alterations only include a dividing wall to create privacy. But the space was so tight, that the openings into the rooms were forced into a 45 degree angle. Revised room with added privacy wall and sliding doors. The intervention is minimal but we are left with a problem as to how to close off the private rooms. The client was not satisfied with cubical curtains. The door track required to open a sliding door at a 45 degree angle is not something that's off the shelf at Home Depot. 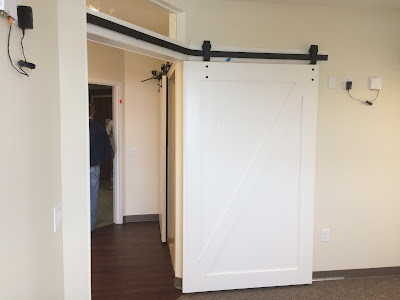 As we are not in the business of inventing door hardware, the Contractor and a local metal fabricator designed and built something that actually worked. But that is only the first hurdle. We had to get the health Department to sign off on it. Did I mention that a floor track was forbidden? The Contractor devised a track that ran along the wall to keep the door from flopping around. A complete mocked up room and opening was built to demonstrate its performance. Mock up - Half Open. Or is it Half Closed? Mock up - Mostly Closed. Mock up - Track from Foyer Side. Mock up - Track from Resident Side. The door was approved and went on to be installed. 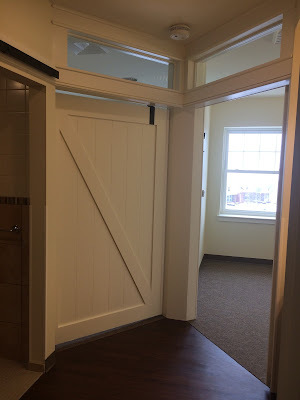 Between the modest renovation plans, tight spaces and an Owner who was unwilling to compromise, a brand new type of door was created. We just don't have a name for it yet. Any inspired suggestions? Finished project - door in closed position. Transom lights allow borrowed light into the foyer. Finished project from the room side. I am an architect with 20-plus years experience in the health care and senior living sector. I am an enthusiastic pragmatist and fan of sarcasm.